Does preUpdate fire if no properties have changed? Does postUpdate fire if no properties have changed? What is the order of operations when using both a CFC event handler and object event handler method? Eureka! The class's event handler method fires before the application event handler CFC. have you seen a cfcomponent impelementing cfide.orm.IEventHandler in tag-notation. 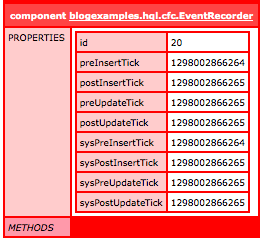 I keep getting "[mycomponent] is not a valid ORM event handler. " It should work the same regardless of if you are using tags or script. Make sure you are implementing the methods correctly. 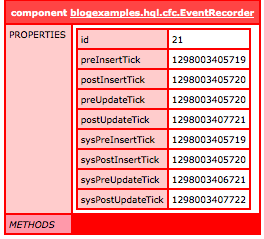 There should be more information available in the log, or enable robust exception information in the CF Administrator.